For decades there was an inside joke that was told by generations of Uyghur students in the School of Humanities at Xinjiang University. The joke went: “How can you be a doctoral advisor without having a Ph.D. degree?” In response they would say, “Work as hard as Abdukerim Rahman!” Mr. Rahman is a legendary figure among students and faculty not only for his knowledge but also his humble and caring attitude toward his students. Students know that if a Uyghur language book had been published, it could be found in his home library. Everyone knows that even those books that are not available in the university library can be found there. Mr. Rahman is known for his passionate scholarship, for his love of book. 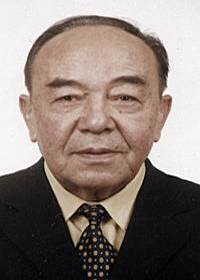 But most importantly students recognize him as the father of Uyghur folklore studies. His humor, inspiration, and positive feedback always encourages their young souls. All folklorists, anthropologists or Uyghur literature researchers who are interested in Uyghur culture view him as an essential resource. His scholarship has become the critical texts in disciplines such as anthropology, ethnology, literature and folklore study. Altinji Ay Roza Idi. It was June and Ramadan. Ata-anam Bolsidi. I wished my parents were with me. Uyghurs have a rich oral tradition like many other Turkic peoples in Central Asia. Mr. Rahman often fondly described a year-long period of fieldwork in 1963 and how he and his mentor carried a very heavy mechanized megaphone record player from Ürümchi to Lopnur, and then on to Khotan and then Kashgar to collect Uyghur oral literature. “It was so heavy we had to travel with donkeys or camels to remote villages to interview and record some of those folk artists” he told his students. However, many of his collections were lost during the infamous Cultural Revolution, and scholars like him suffered a great deal during periods of imprisonment. After those dark years ended and he was rehabilitated, beginning in 1979 he spearheaded efforts to collect and research oral traditions. Every year he took literature students from Xinjiang University to do fieldwork in various towns across Xinjiang and subsequently helped them publish the written versions of their notes. In 1983, he started the first graduate program at the university in Xinjiang Minority Literature. Rahile Dawut was one of his first graduate students. He not only sent his students to do fieldwork in Xinjiang, but also to Gansu to visit Yugurs or “Yellow” Buddhist Uyghurs and to Yunnan to visit other ethnic minorities. In 1996, he became the first advisor for doctoral students in the School of Humanities; he mentored more than 30 master students and 13 doctoral students from different ethnic backgrounds. In 2000 he also became a founder of the Folklore Museum at Xinjiang University. Each year, students and faculty members donated their ethnographic and archeological collections to this museum. He donated dozens of volumes of his fieldnotes to this museum and encouraged other people to contribute to this institutional archive. 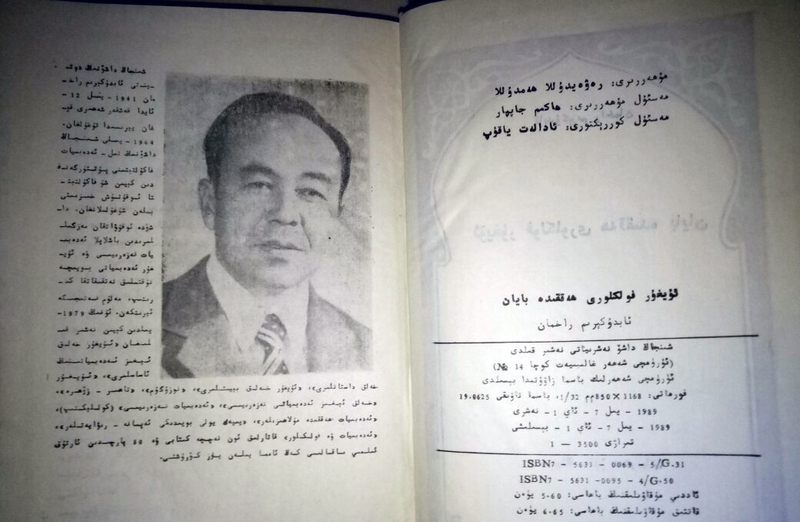 The inside cover of Abdukerim Rahman’s 1989 book Uyghur Folklore. Over the course of his career his book Uyghur Folk Literature was reprinted more than ten times. He published more than 20 books such as Theories of Literature, Uyghur Folklore, History of Uyghur Culture, Uyghur Folk Tales, Uyghur Ballads. He also published more than 150 articles and oral tradition collections in numerous widely-read journals. After toiling for many years, he published a monumental 12-volume work, Encyclopedia of Uyghur Folk Literature, which contains thousands of legends, folk tales, epic poems, ballads and proverbs. It was a collection of his lifework, a monument he was very proud to give to the world of Uyghur knowledge. Uyghurs have a deep respect and care for elders. Figures like Mr. Rahman are regarded as spiritual guides for the community. 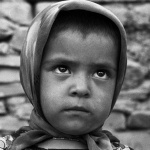 Many Uyghurs were cut to the core by the knowledge of his incarceration. Prior to Mr. Rahman’s detention, they were deeply troubled by the news of an another elderly religious scholar Muhammad Salih’s death in one of the camps. Yet compared to Mr. Salih, it was hard to see the logic behind Rahman’s criminalization since his teaching and research had little to do with religion. With the exception of those ten dark years between 1966 and 1976 he had been accepted and celebrated by the Chinese party-state for over 50 years. How could a man could be celebrated until the age of 77 and then suddenly charged as a “two-faced” person out of nowhere? Where is his second “face”? The only explanation Uyghurs can conclude is that because he is Uyghur and has a profound knowledge of Uyghur culture, he has become a suspect. He is a victim of the Chinese party-state’s decision to eliminate aspects of Uyghur culture that is no longer “permitted.” Taking pride in Uyghur traditions is now a “crime” that deserves punishment. 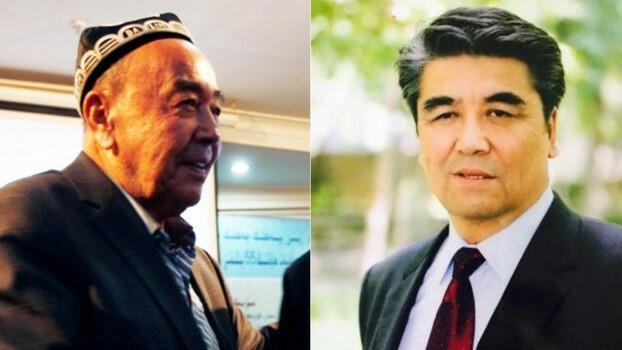 How can China justify its treatment of its own Uyghur scholars? These scholar-Party members were an important bridge between the party-state and the local community. What will be the effect of breaking these bridges? While China is justifying its “transformation through education” camp system as necessary strategy to achieve “long-term stability,” how can it justify its treatment of its own scholars? These scholar-Party members were an important bridge between the party-state and the local community. What will be the effect of breaking these bridges? Many Xinjiang observers believe that China is carrying out such mass detentions without consequences because of their newly gained economic, technological, and military power. Perhaps the country’s emerging super-power status gives the Party the sense that they do not need bridges like Mr. Rahman anymore and such bridges have become disposable. For people who know Mr. Rahman and his habit of reading and writing every day, even when he was in hospital, it is heartbreaking to imagine his present circumstances as a prisoner. How is he surviving without his beloved books?